The offense of “corrupt activities” in terms of section 4 of the Prevention and Combating of Corrupt Activities Act 12 of 2004 (“the Act”). 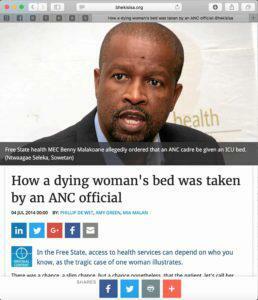 An article titled “How a dying woman’s bed was taken by an ANC official” appeared in the Mail & Guardian on 4 July 2014. The article states that MEC Malakoane, with the assistance of his Head of Department David Motau and Deputy Director-General Teboho Moji, ordered that a patient be admitted to the Intensive Care Unit (“ICU”) at Dihlabeng Regional Hospital despite that the patient did not qualify for admission to the ICU and patients who did qualify for admission had been turned away the same night because the ICU was at capacity. The article indicates that the officials ordered the patient to be admitted to the ICU due to the patient’s political position and connections. The patient was admitted and several other patients who qualified for admission were turned away while he was occupying a bed. A patient who was removed from the ICU to make room for the undeserving patient died in an ordinary ward of the hospital. On the night of 27 June 2014, MEC Malakoane and HoD Motau entered Pekholong District Hospital in Bethlehem and instructed health officials, who were subordinate to the MEC and the HoD, to refer a patient (“Patient X”) to Dihlabeng Regional Hospital to be admitted to the Intensive Care Unit. Pekholong District Hospital does not have an ICU whereas Dihlabeng Regional Hospital does. A doctor who informed the Mail & Guardian of this information requested anonymity for fear of being fired. Moreover, the real name of Patient X is known to the Mail & Guardian. It is alleged that Patient X was politically connected and an office bearer of the African National Congress. When Patient X arrived at Dihlabeng Regional Hospital, the ICU consultant on duty assessed him and found that he did not qualify for admission to the ICU because he was in the last stages of a chronic condition and was unlikely to recover. A senior doctor at Dihlabeng hospital explained “no other ICU in the country would admit a patient like that, especially over other patients we could more likely save.” The ICU was at capacity and two critical patients had been turned away that night due to space constraints. Even though a patient with a prognosis like that of Patient X is usually cared for at a primary level, Patient X was admitted to a secondary level medical ward. Another doctor at Dihlabeng hospital explained that “the medical professionals on duty were in trouble for not sending [Patient X] straight to ICU” even though Patient X had already been admitted to a higher level of care than he should have been. On 2 July 2014, Patient X remained in the ICU with no improvements to his condition. It is alleged that during the previous days, several critical patients deserving of admission to the ICU were turned away due to the lack of capacity. It is particularly alleged that a patient who qualified for admission to the ICU but was turned away died in an ordinary ward of the hospital on Monday 30 June 2014. In addition to the information reported in the Mail & Guardian, the TAC has reason to believe that Patient X was a relative or associate of another senior political leader in the Free State. The TAC also have reason to believe that members of the staff at Dihlabeng Regional Hospital and Pekholong District Hospital can confirm the facts reported in the Mail & Guardian. An article appearing on page 15 of the Mail & Guardian on 22 August quotes MEC Malakoane as providing a very different account: “I didn’t even know the patient’s identity or that he had been transferred to ICU … All I did was to ask [medical personnel] to isolate the patient, who appeared to be in a coma, to prevent psychological trauma to the ones next door.” (“They call me a killer when I know I’m a saviour, says Malakoane”, Mail & Guardian, 22 August 2014). (iv) that amounts to any other unauthorised or improper inducement to do or not to do anything, is guilty of the offence of corrupt activities relating to public officers. (h) exerting any improper influence over the decision making of any person performing functions in a public body. The TAC believes that the officials may have agreed to accept “gratification” for the benefit of Patient X in the form of a bed in the ICU and the financial and other resources that accompany the bed. DDG Moji may have agreed to accept the same “gratification” from these sources as well as from MEC Malakoane and HoD Motau. The relationships between these individuals may constitute a “mutually beneficial symbiosis … generating a sense of obligation” on the officials; such relationships have been determined to be a form of “gratification” for the purposes of a charge of corruption under section 4 of the Act. [S v Shaik 2007 (1) SA 240 at 33]. acted in a manner designed to achieve an unjustified result. exerting improper influence over the decision making of people performing functions in a public body. exposing themselves to a situation involving the risk of a conflict between their official responsibilities and private interests. The Public Finance Management Act 1 of 1999 (“the PFMA”) provides that HoD Motau is the Accounting Officer of the FSDoH. makes or permits an unauthorised expenditure, irregular expenditure or fruitless and wasteful expenditure. Section 86 of the PFMA provides that an Accounting Officer of a department is guilty of an offence if he or she “wilfully or in a grossly negligent way” fails to comply with these responsibilities. The TAC believes that HoD Motau may have wilfully or in a grossly negligent way failed to comply with the above provisions of the PFMA. Section 86 provides that he may be fined or imprisoned for up to five years if convicted of this crime. The National Prosecuting Authority has charged Malakoane with multiple counts of corruption for which he faces a minimum sentence of 15 years imprisonment. He was arrested in regards to these charges on 10 July 2013 following a 2010 Commission of Enquiry that produced incriminating allegations against him. The prosecution alleges that Malakoane used his position as Municipal Manager of the Matjhabeng Local Municipality in 2007 and 2008 to conduct extensive fraud and corruption. 27 August 2014, his prosecution was again postponed for the umpteenth time.